The Vatican City is a champion for contemporary architecture, according to Norman Foster, one of several architects commissioned by the Catholic city state for the Venice Architecture Biennale. Speaking to Dezeen in Venice, the Foster + Partners principal said the Vatican City should be congratulated for its debut biennale contribution – instead of curating a traditional exhibition, it commissioned 10 architects to design and build contemporary chapels. "I think it's a very noble initiative and I think they should be congratulated," he said. "I think it's terrific, I think it has to be welcomed." "Architecture needs patrons, so if the Vatican is a patron and encourages architects from around the world to select a site and to create a space for contemplation... I think it is exactly what architecture needs and what architects need – encouragement and patronage." Foster was one of 10 architects who unveiled a chapel on the Venetian island of San Giorgio Maggiore last week, along with Eduardo Souta de Moura, Smiljan Radić and Sean Godsell. His contribution is a timber structure covered in jasmine views, which frames a view out to sea. The contemporary chapels are all designed to question the meaning of the chapel in the 21st century. They join the 130 churches that already exist across Venice's islands. Foster said that religious buildings are still an important public space for reflection, irregardless of beliefs. "I think all of us who lead busy urban lives are grateful for the opportunity to reflect, and reflect on ones good fortunes, which is perhaps why tourists are continually drawn to places of worship – on a grand scale or on the humble scale of a chapel," he said. "I think there's an inner nature and there are certain values which are universal across different beliefs and religions, and the one common denominator is that religious buildings create a space for reflection and contemplation." The architect said public space was a key element of all his projects. He cites his design for 30 St Mary Axe – the Gherkin – as a key example. "I've been fascinated ever since I was a student, and still am, by the concept of public space – and this is one version of it. If I think of any of the buildings that involve me, they in one way or another engage with the public domain," he added. "The so-called Gherkin narrows at the base so it creates public space. I think that that concept of the public domain interacts with pretty well anything that I touch." 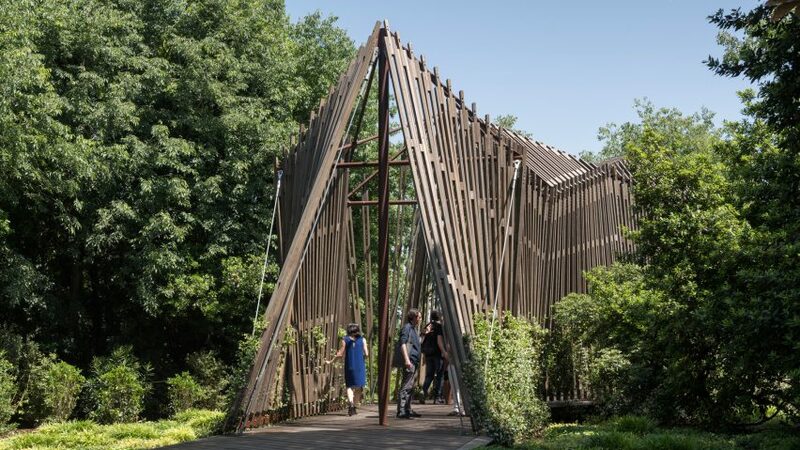 The Holy See Pavilion is one of 63 national pavilions at this year's Venice Architecture Biennale, which continues until 25 November 2018. It is the second venture the Vatican City has made into the contemporary art and design world of late, having also recently contributed pieces to an exhibition exploring the ties between fashion and the Catholic church at New York's Metropolitan Museum of Art. Norman Foster heads up London-based studio Foster + Partners, which came in at number 13 on the latest Dezeen Hot List – a guide to the most read about personalities, studios and organisations in the industry. The firm has recently completed a hotel in Hong Kong inside a former government headquarters and unveiled its masterplan for a new state capital of Andhra Pradesh in India, which will centre on a governmental building with a needle-like roof. Foster + Partners working on a droneport in Rwanda, which will be used as a hub for unmanned flying vehicles transporting urgent medical supplies to remote parts of the country. Foster features in Dezeen's new documentary Elevation. In the film, which looks at how drones will shape the future of cities and transport, he forecasts the development of "aerial highways".